Good morning one and all! Can you believe we are over halfway through January and before we know it it’ll be February. 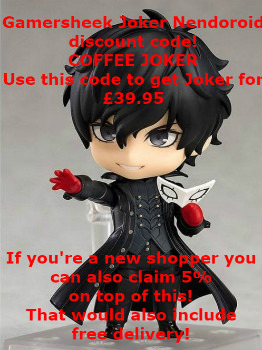 Crazy, isn’t it?! As many of my readers will know from throughout 2018, pin badges was something I came to love so much and buy monthly, as well as worth with some amazing companies to show off some gorgeous designs. 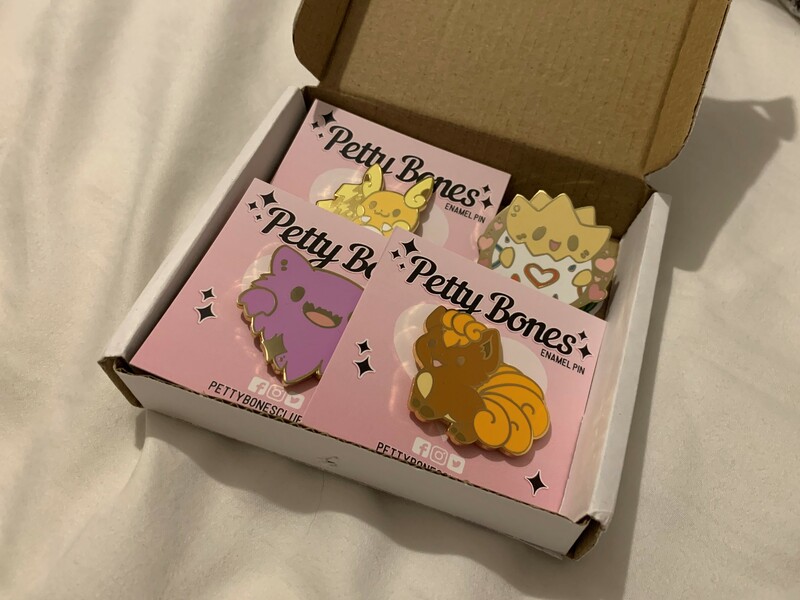 I can’t believe it’s been just over 5 months now that I became a brand rep for Petty Bones Club (which you can read all about here, as well as see the goodies I received in my first package! ), which was one of my favourite things to come out of my blog in 2018. 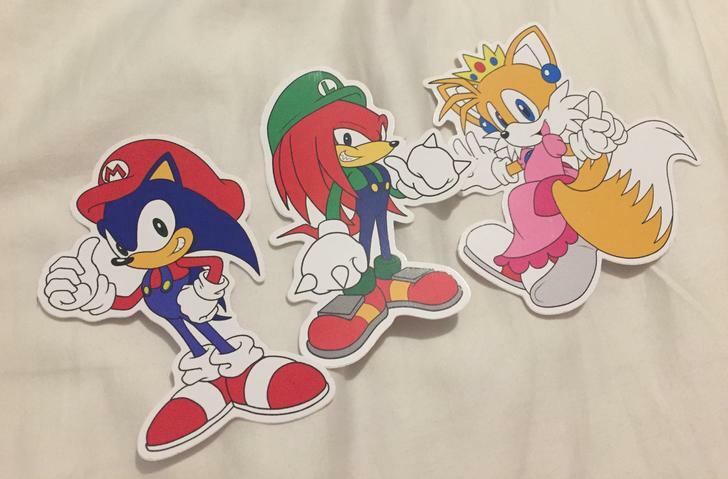 Their pin badge designs are gorgeous and I love how chubby and cute the designs are. 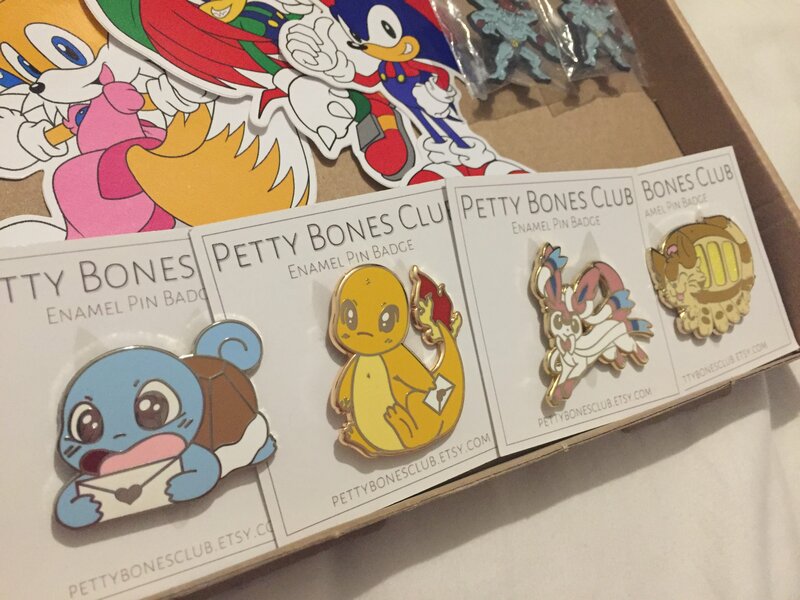 Back at the start of September Petty Bones Club released a new Kickstarter (you can see it here, even though you can’t pledge anymore), which campaigned to launch a mixture of different Pokemon pin badges. 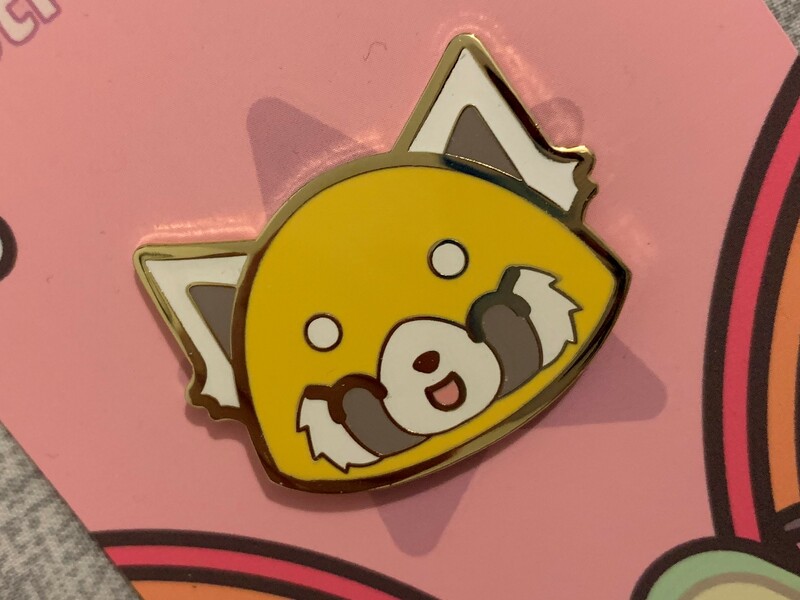 Of course I backed it and opted for the cute Growlithe pin! 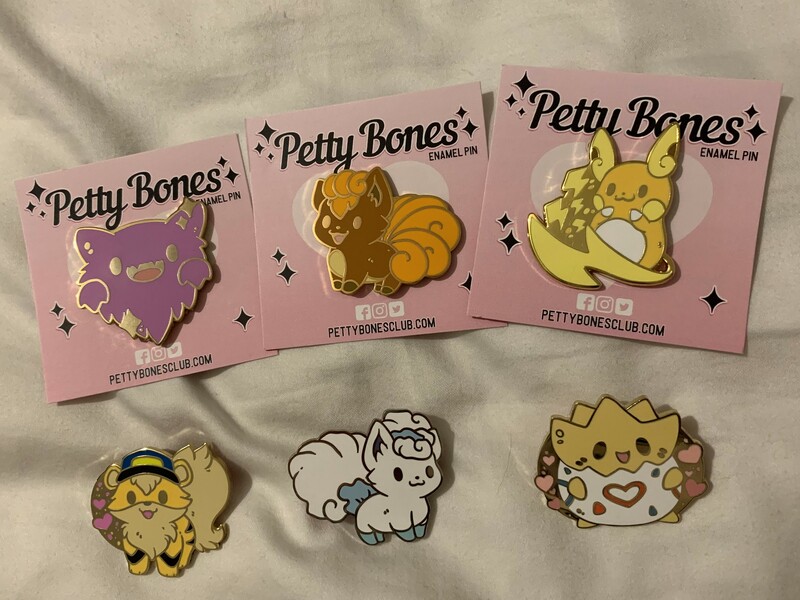 About a week ago I reached out to Lauren over at Petty Bones Club to see if she would like me to talk about her new Pokemon pin badge designs on my blog, which she was more than happy to do! She sent me a handful of items to talk about, which I am so excited to share on here with you guys! 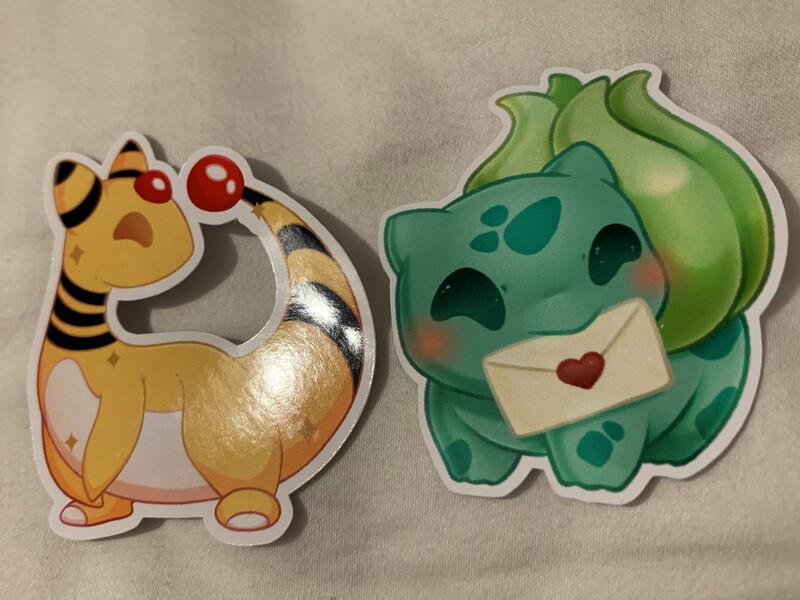 If you love Pokemon and pin badges, I’m sure you’ll be taken in by how cute and adorable these designs are that she sent me. As well as the designs she sent me, I’ll be talking about the ones I received from backing the Kickstarter campaign. 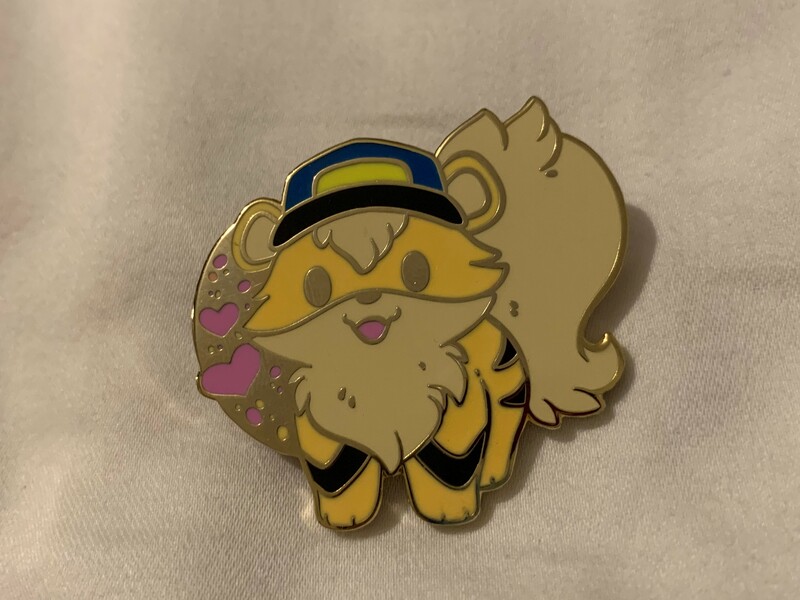 Officer Growlithe enamel pin – £8.00 – (link) Officer Growlithe reporting for duty! 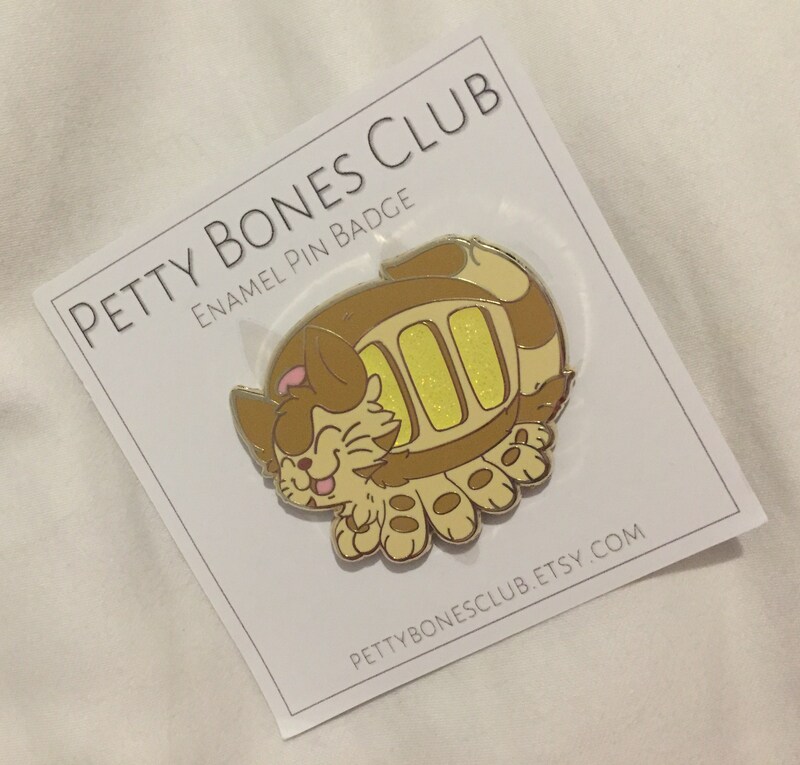 This is actually the pin I picked up from my Kickstarter and as soon as the design was revealed by Petty Bones Club I KNEW I had to have it! Growlithe is such a cute Pokemon and I’m pretty much I don’t just speak for myself when I say how it reminds us of both Jesse and his Growlie, as well as the fact that the Officer Jenny’s have Growlithe’s. The latter is obviously where the pins design stemmed from, which I LOVE. The Growlithe is just so chubby and kawaii looking and with its little cap on we know for a fact it’s on duty and ready to go! 😛 It just puts so much joy to my day when I wear this design on my cardigans during my shifts at work, as well as weekends off on hoodies and jackets. If you didn’t guess by now, this is my favourite design out of the bunch. Togepi enamel pin* – £8.00 (link) Everyone’s favourite little egg! 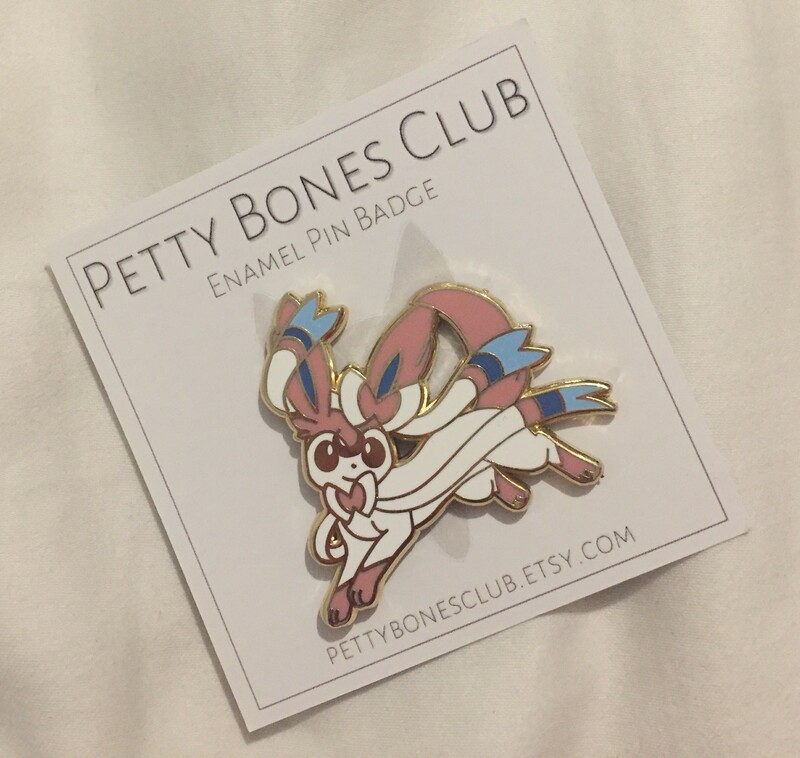 This is one of the pins that Petty Bones Club sent me and it’s so adorable! Like Growlithe, the first thing people think of when they see a Togepi is how it was Misty’s Pokemon in the anime series. 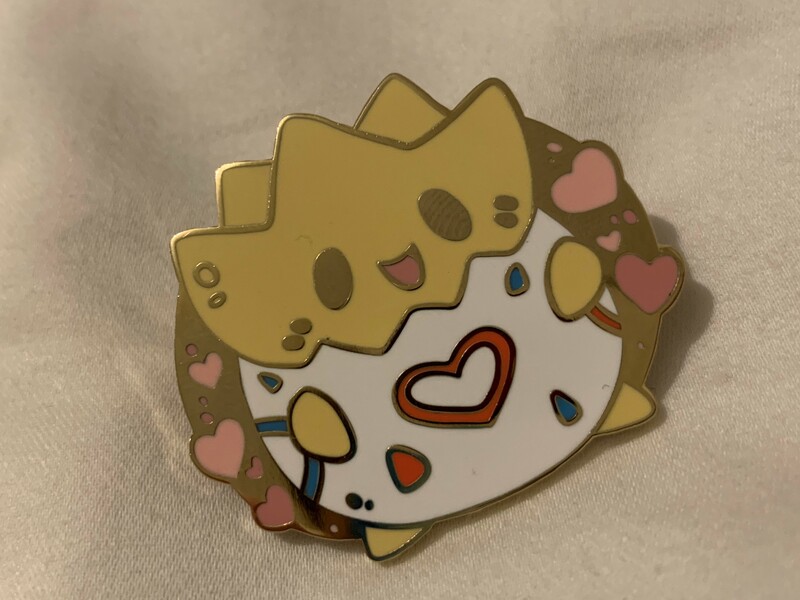 This little Togepi pin badge is so adorable and clearly very lovable due to the hearts surrounding it. This little Togepi is so damn cuddly looking and happy that I can only imagine how much attention this pin would gain you whilst wearing it! This is definitely one of my favourite pins from this collection for so many reasons! For a spooky boi Petty Bones Club has done such a good job at making him a cutie spooky boi. 😛 He’s a really generous size, which I really like as I feel if he was smaller all the detail that’s been put into him wouldn’t really look as good. He’s just so cute and that’s something I honestly love about this collection as a whole. 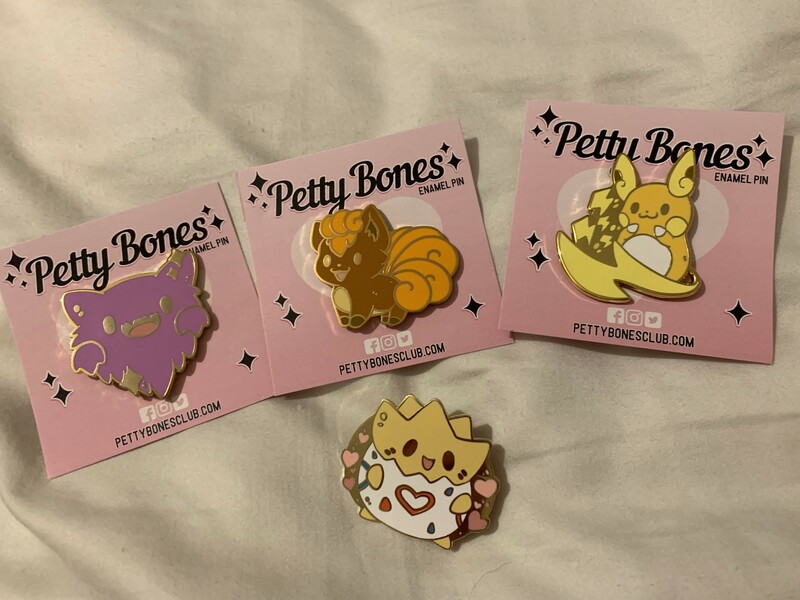 Yeah Pokemon are cute, but Petty Bones Club just has a way of making all her designs look cuddly and adorable. I can’t wait to wear this pin badge out and about, as I already know it’s going to get a lot of attention. 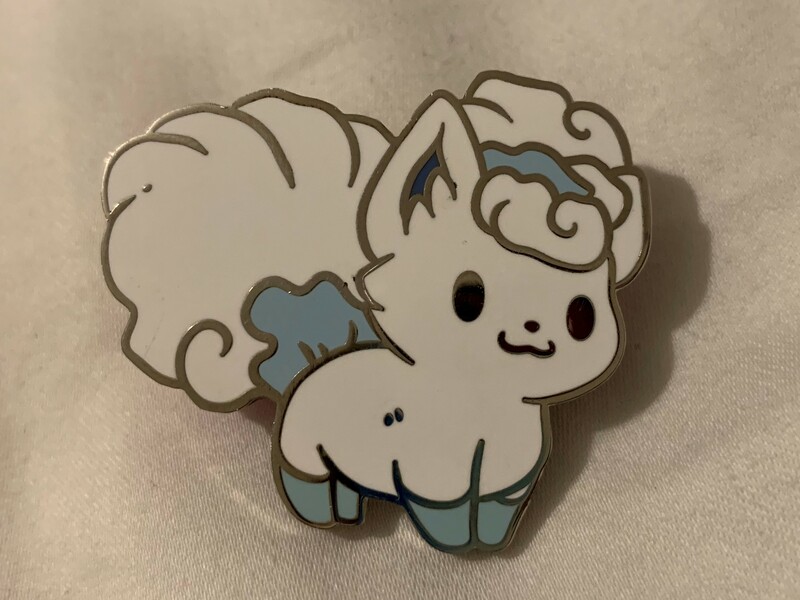 Alolan Vulpix enamel pin – £8.00 (link) The prettiest white fox! 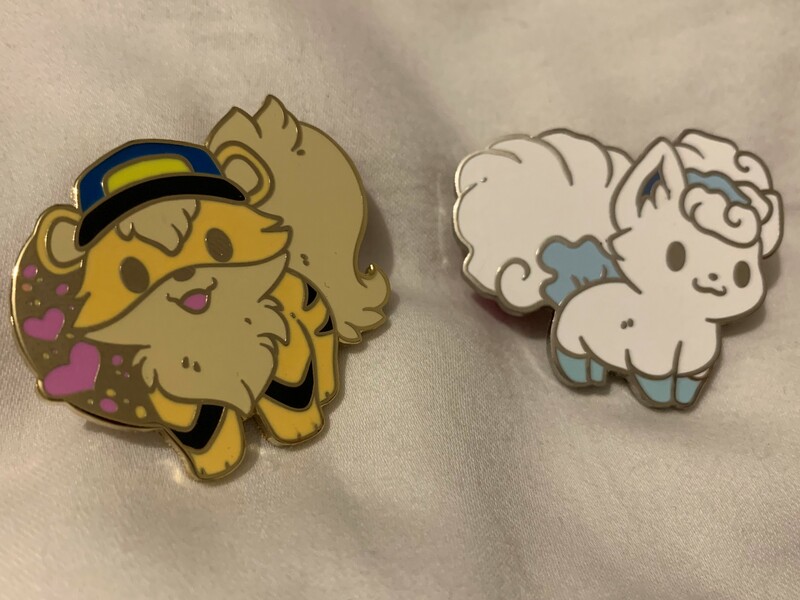 This Alolan Vulpix pin actually came with my Officer Growlithe pin when my Kickstarter order arrived! I can only assume this was a little extra from Lauren to thank me for my continued support. Either was it was a cute and lovely gesture! This is the only pin out of the Pokemon collection to be silver plated, which in turn works so well for the Alolan Vulpix design! If this had of been on a gold or even rose gold plating it wouldn’t have looked right. 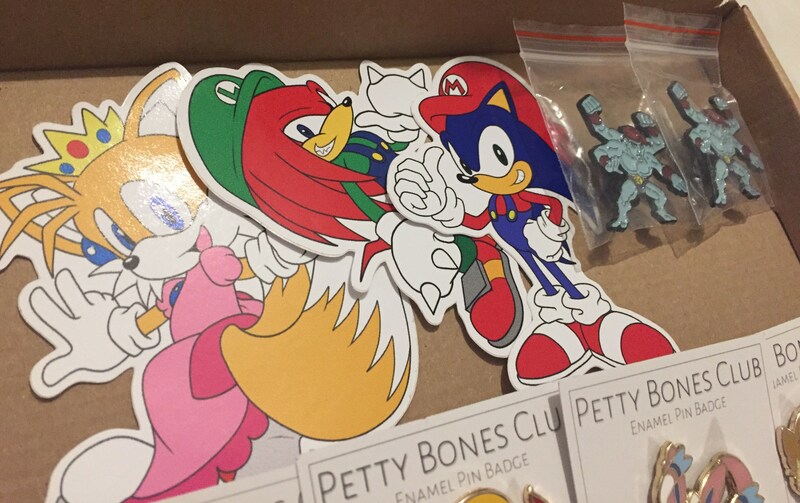 I remember when I received and reviewed some of the pin badges last time from Petty Bones Club, I loved how the colour of the metal used for each pin worked in part with the colours of the design. It’s such a small thing, but something that I always notice when ordering pin badges for myself. 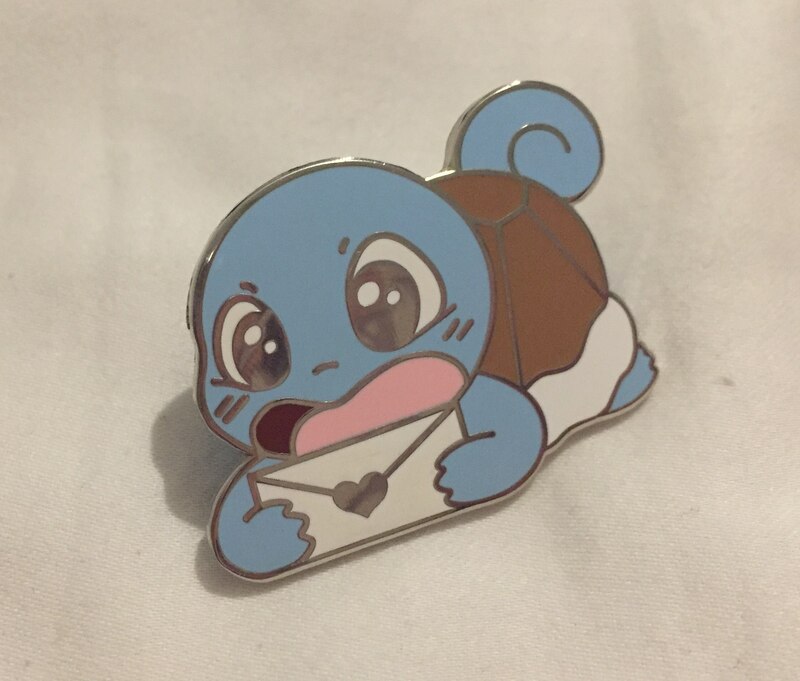 This is another one of my favourite pins, it’s so damn cute and I remember awing at it when I opened the little package that all the goodies Lauren sent me were in. 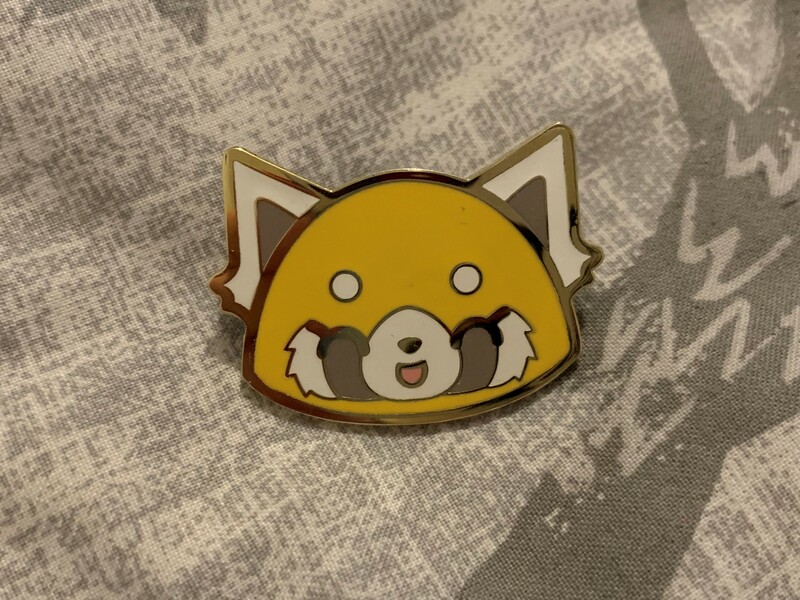 Although I love foxes and Vulpix, I didn’t actually own a Vulpix pin badge until Lauren sent me this one! I’m so chuffed to have it in my collection now in all honesty as Vulpix’s little face is so damn cute! 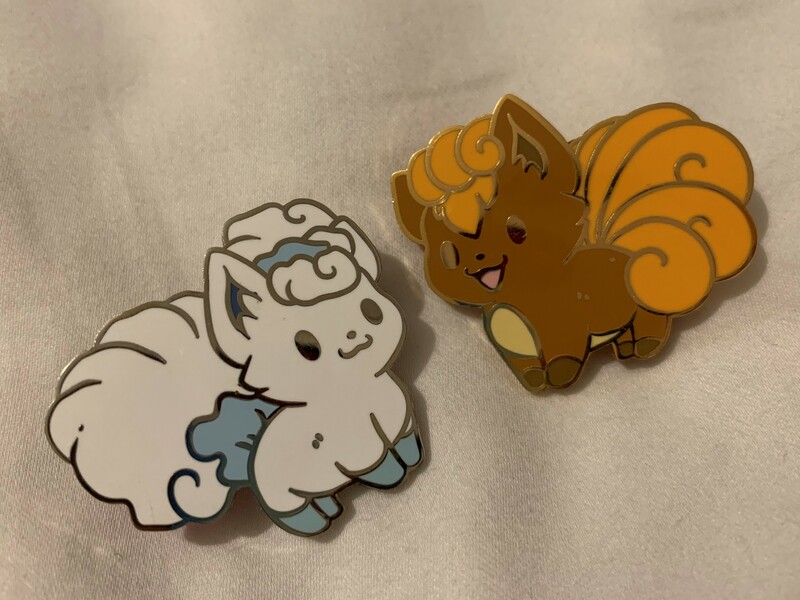 I love how both the Vulpix and Alolan Vulpix are completely different. It means they can be worn together but look different. Alolan faces right with a shut smiling mouth, whilst Vulpix faces left with an open smiling mouth. I love the differences between the two! 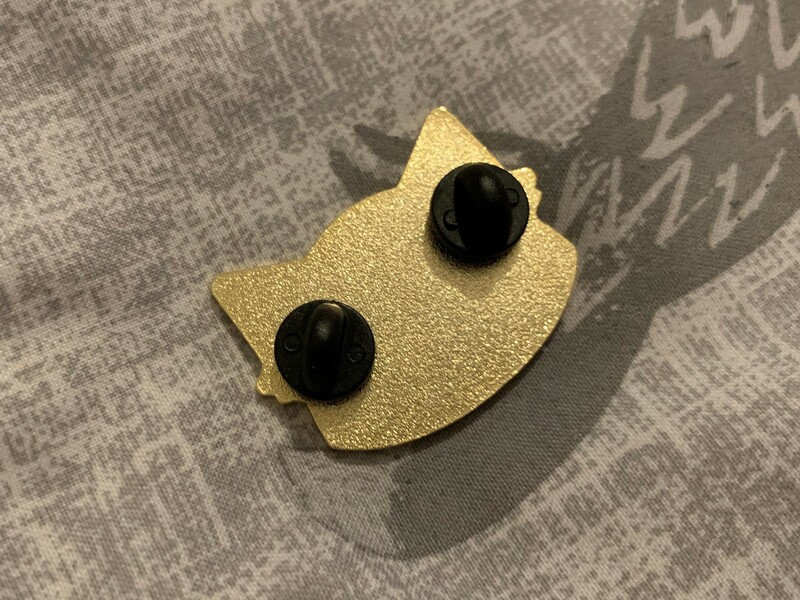 I plan to wear them both at the same time on my Persona 5 jacket (which you can see and read about here) as I know these will attract loads of attention and questions from Pokemon fans, both old and new. I just love the little face on Vulpix, it looks so happy! 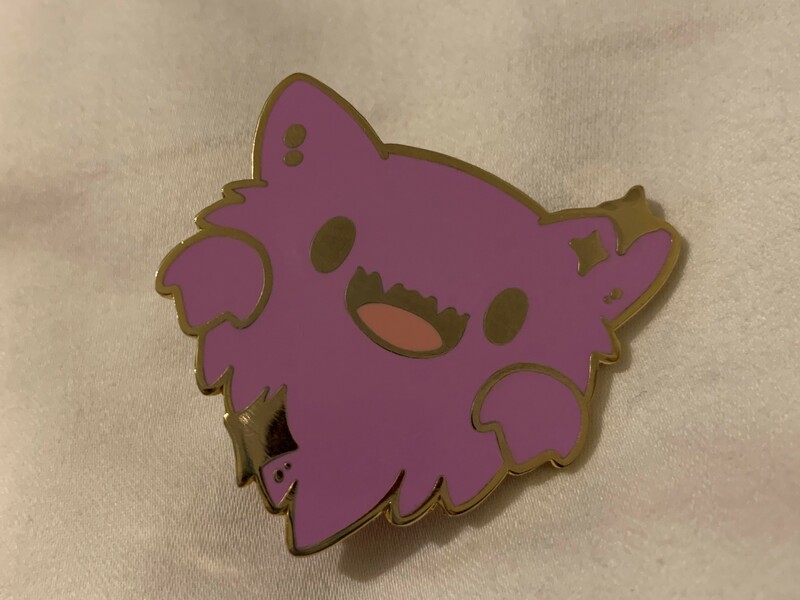 Like the Alolan Vulpix, this is on a different coloured plating to the rest of the pins. 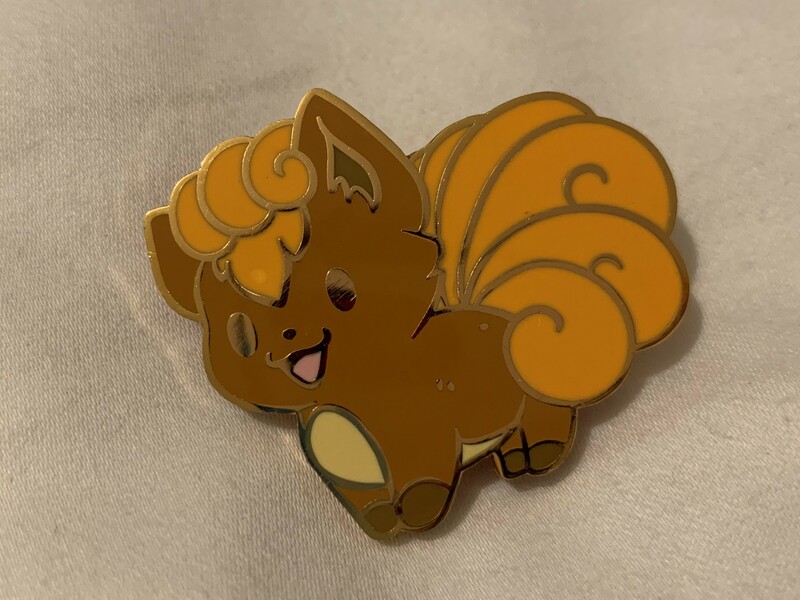 This Vulpix is actually on a rose gold plated enamel, which I really love! It works so well for the colour scheme of the pins design and if anything really does add something a little more. 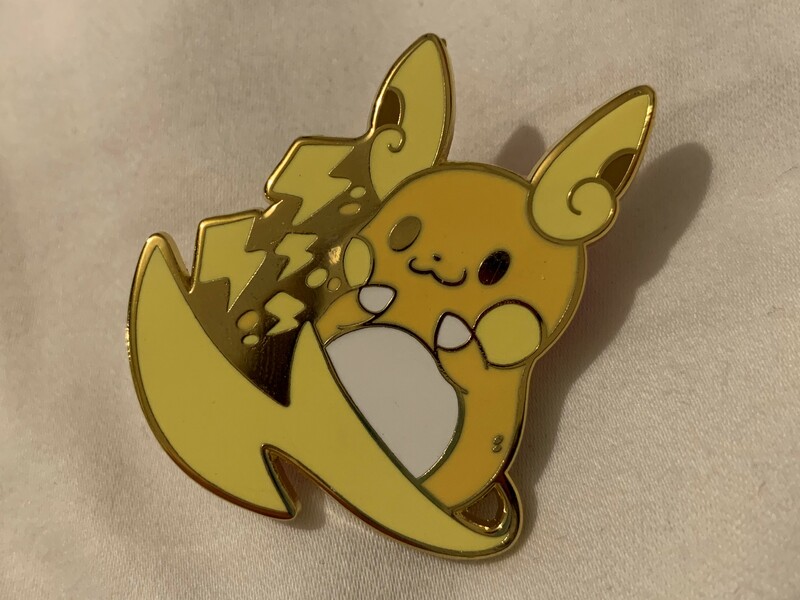 Alolan Raichu enamel pin* – £8.00 (link) If you thought Raichu was cute, think again! Alolan Raichu is not only super cute, he can also surf on that super cute tail of his! 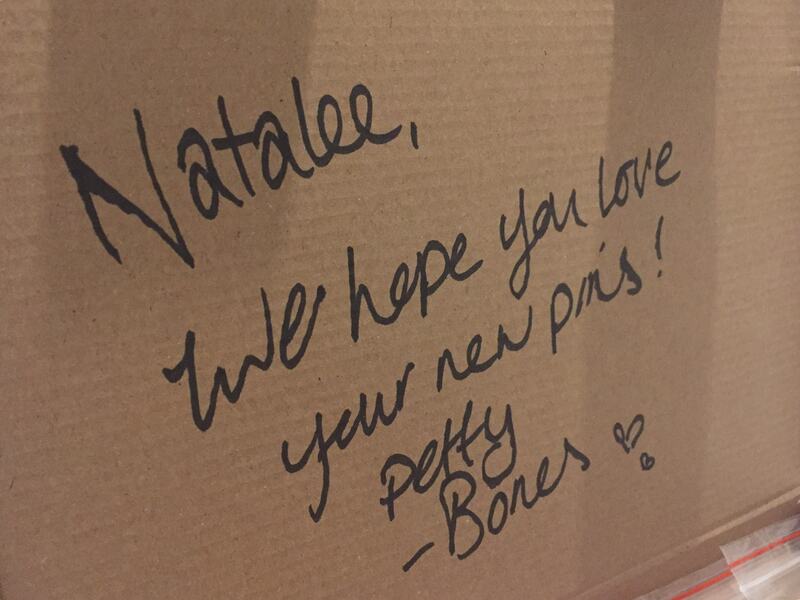 So those are 6 out of 8 of the designs I bought and was sent by Lauren over at Petty Bones Club. 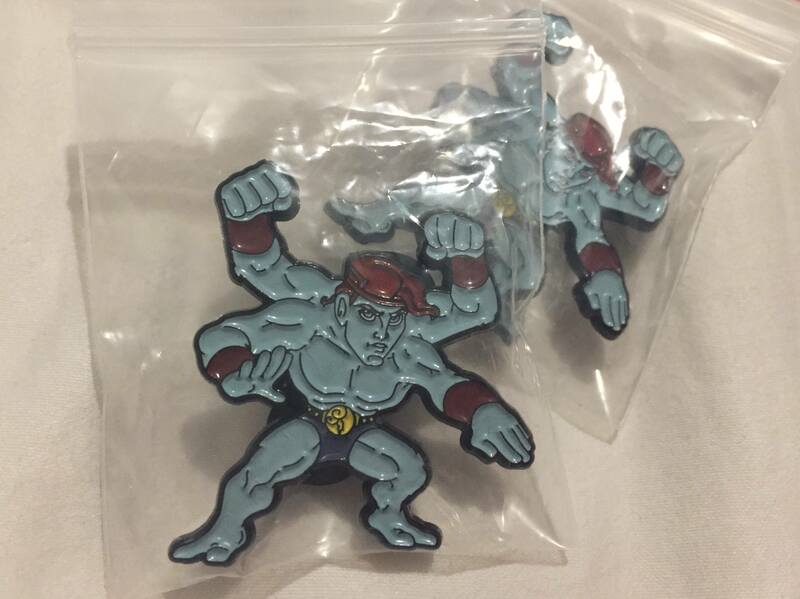 All of the pin badges are amazing quality, in both design and enamel pins themselves. With all of Lauren’s work you can really see she’s put some time, thought, effort and especially love into all of the designs of the Pokemon and although I have some favourites, I do love them all! 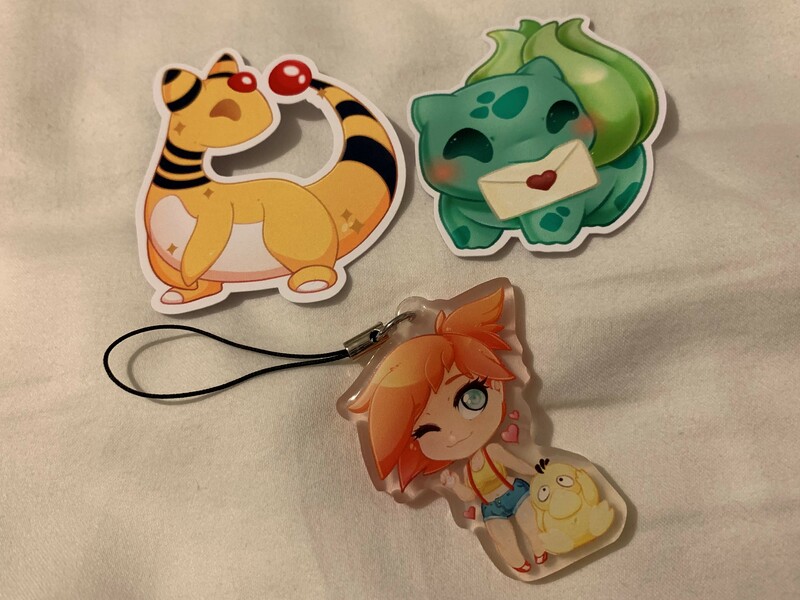 Alongside all the cute pins she sent me, she also sent me some Pokemon stickers, as well as a charm of Misty with Psyduck! 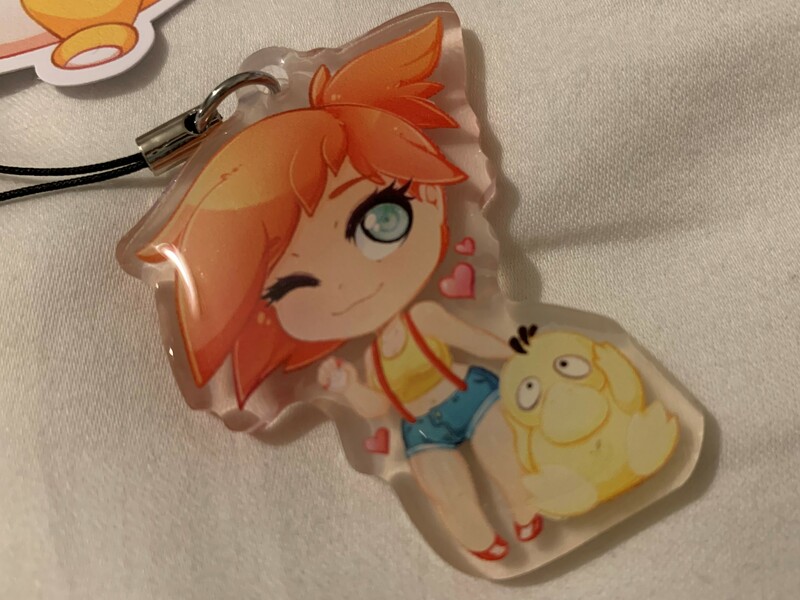 I received one of these with my Kickstarter order and I love the design so much! I’d love for Lauren to come out with Ash with Pikachu and Brock with Vulpix too. 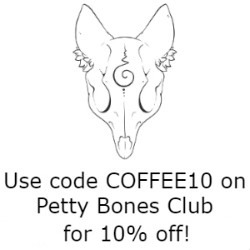 I’ll pop Petty Bones Club’s website down below again, as well as all their social media pages! 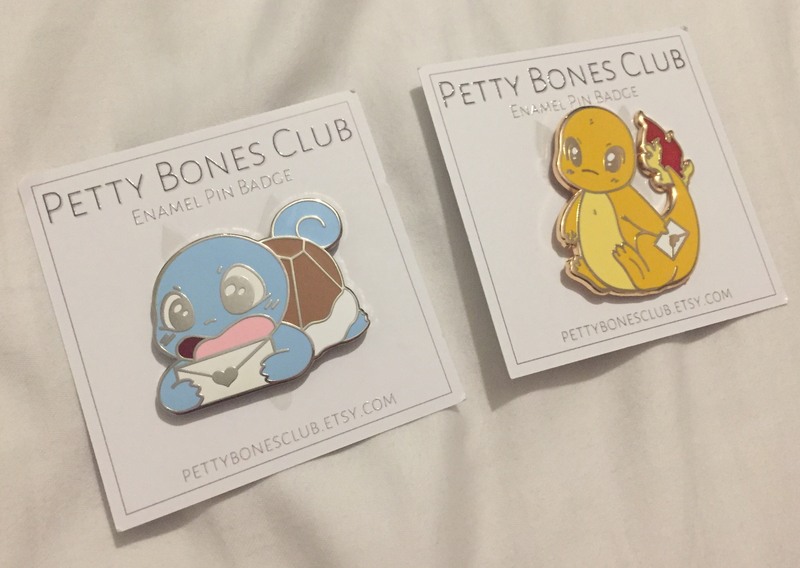 What do you think of Petty Bones Club’s Pokemon Collection pins? Would you pick any up? If so which design(s) would you grab? 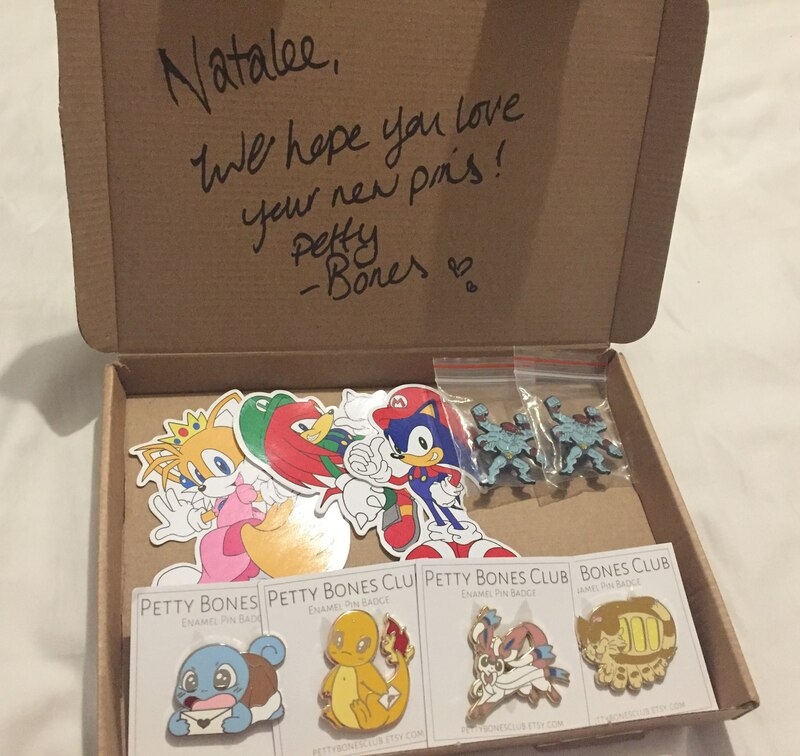 If you do want to pick up any pin badges from Petty Bones Club don’t forget I have my unique code that you can use to bag yourself a cheeky 10% off when you order! It’s always on the right hand side of my blog, but I’ve popped it above for you to look at too. You know when I say, “This is a blog post I’ve been meaning to do for a while!” on some of my posts? Well I usually mean a couple of weeks… However this time I mean months. I’ve been meaning to write this post FOR MONTHS. Now in this circumstance I have been meaning to talk about Ohayou Clothing! in general for YEARS now and I honestly mean that! It’s taken me so long to write about this brand and Chrissy the amazing owner because I’ve wanted to make sure what I write and post about her is exactly spot on and be perfect. I have finally decided exactly how I want to talk about Ohayou Clothing! 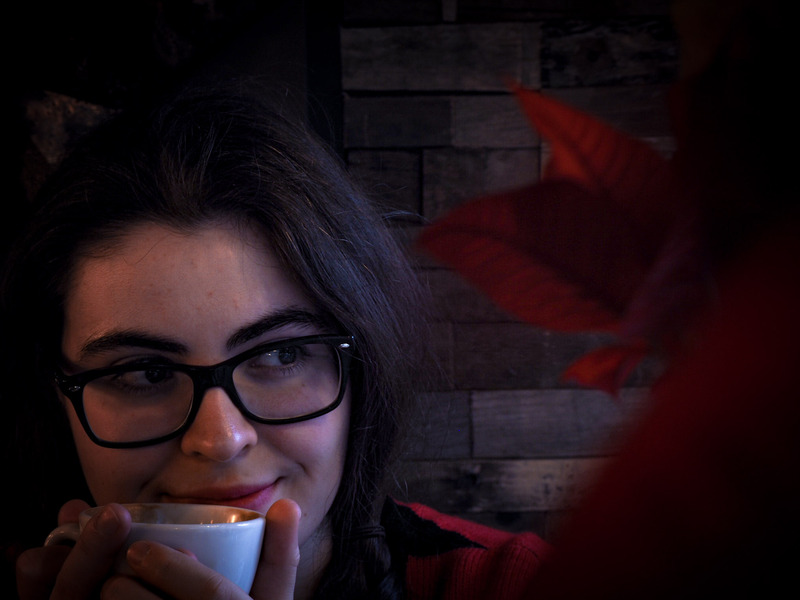 on my blog and I am so bloody excited to be honest with you! I’ve been working on this blog post mentally for months now, since the Eeveelution Kickstarter launched in March. 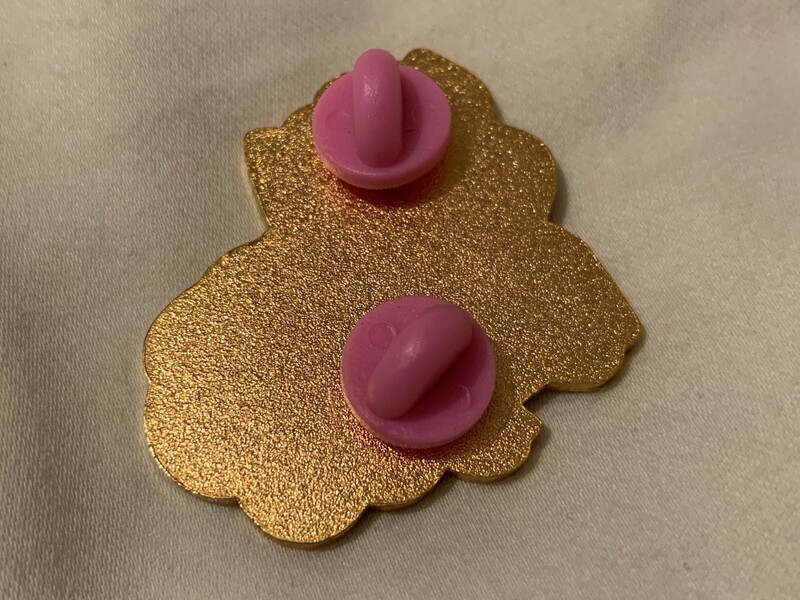 Instead of talking about any of the clothing I own by Ohayou Clothing!, I thought I would start on my ever growing pin badge collection and at the moment Ohayou Clothing! is dominating my pin flag… Soon enough I’ll have to get a separate pin flag purely for her marvellous pins. ANYWAY enough chin wagging, it’s time to FINALLY get on with my first (of I’m sure many) Ohayou Clothing! post! When Ohayou Clothing! 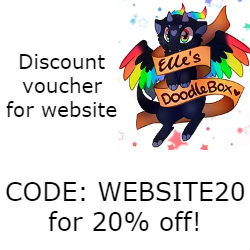 announced her Sleeping Eeveelutions Kickstarer campaign I was so excited and made sure to back her campaign as soon as I could! She had a few issues with her Kickstarter due to copyright issues with Nintendo and Pokemon and it had to be frozen for a while. However, it was all sorted in the end and her Kickstarter continued and it did so well. I’m so proud of how much she made with the campaign! It’s definitely a Kickstarter I’ve had a pleasure being a part of. 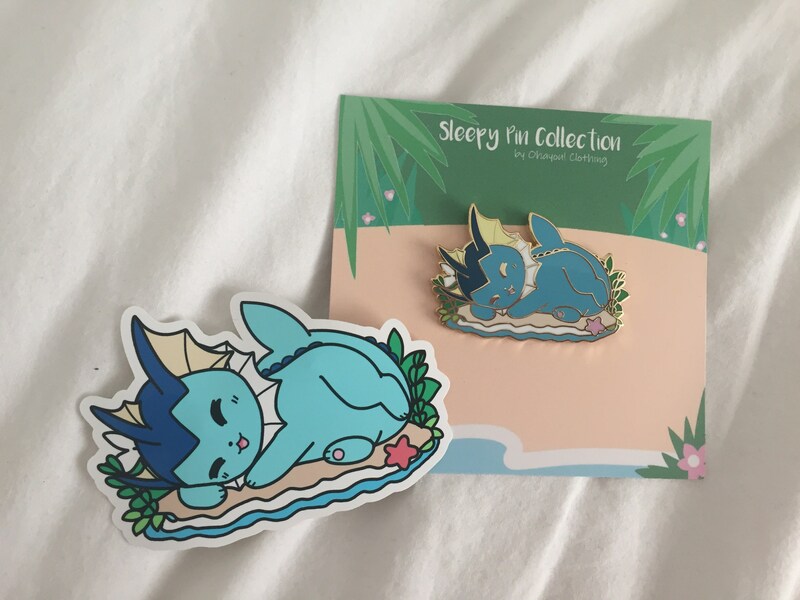 When the campaign came to an end, it was time to decide which pin design you wanted and the one I settled on (after a bit of a struggle) was the sleeping Vaporeon pin. It’s so adorable and cute! 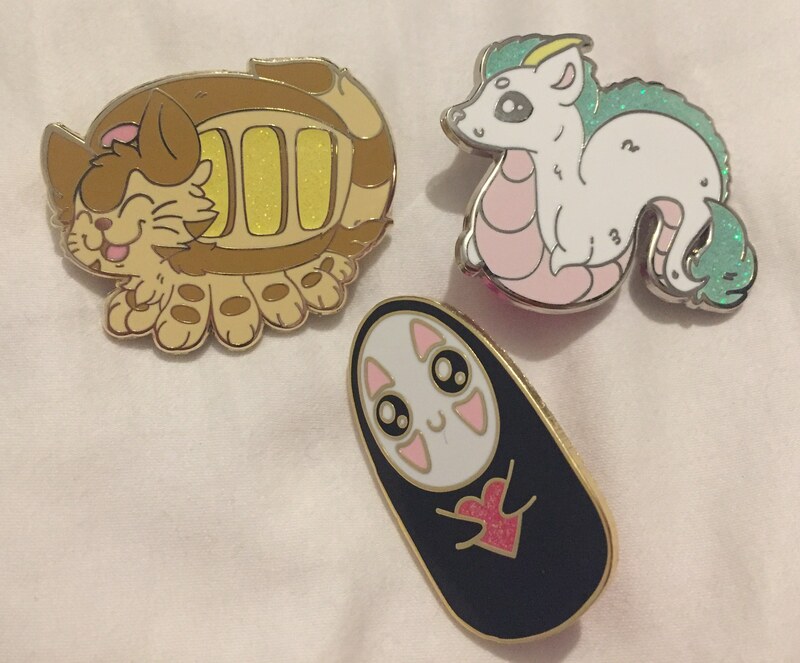 I love how all of the sleeping Pokemon pins have themes based on their type. Of course Vaporeon being a water Pokemon it’s sleeping on a beach. It was tough to be honest having to pick just one pin as my reward (I only opted to back one as my pin obsession was pretty nonexistent then…) only allowed me to have one pin. I just love Vaporeon though and the beach scene reminds me of Fuerteventura, which is my second home. 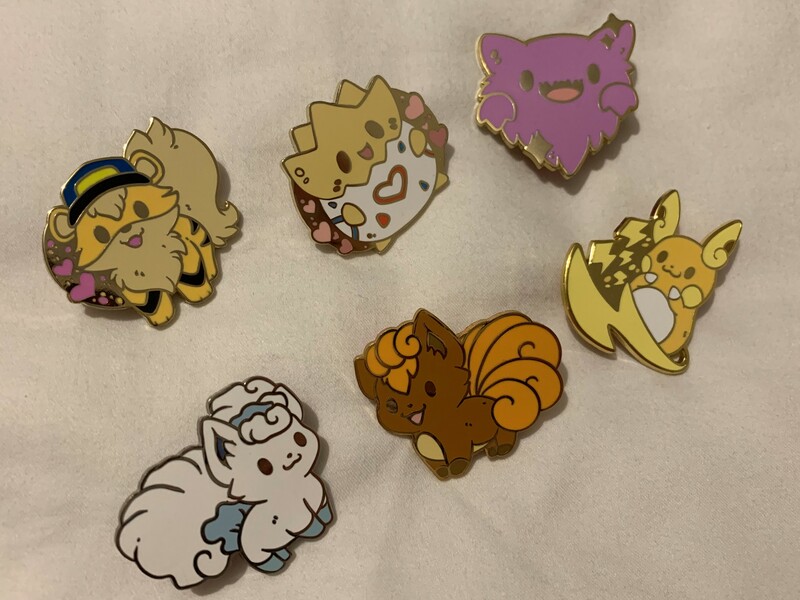 After these pins were released and sent to their new owners, Chrissy opened up a secret shop on her store for people to come and buy brand new sleeping Pokemon pins, as well as seconds pins. 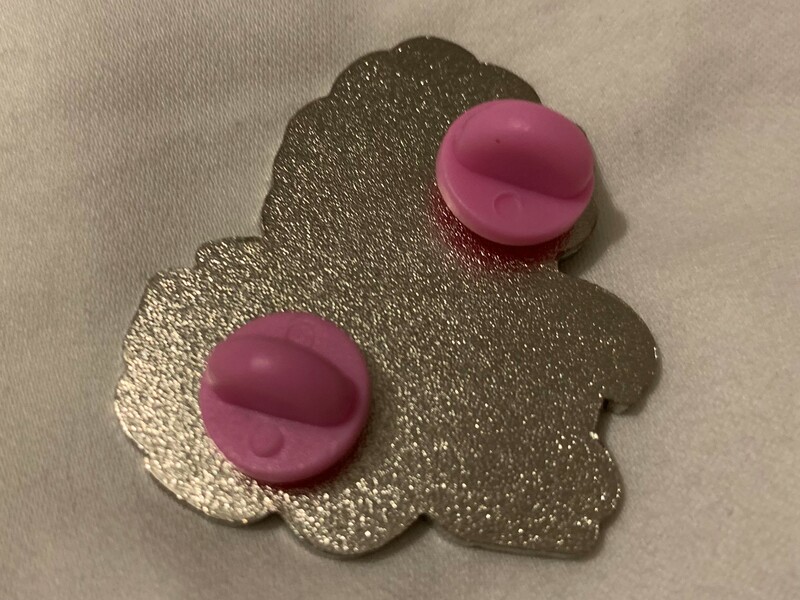 Seconds pins are pins that have been sent with issues, such as wrong colour, marks on various parts of the pin and basically just anything wrong with the pin that you can think of! 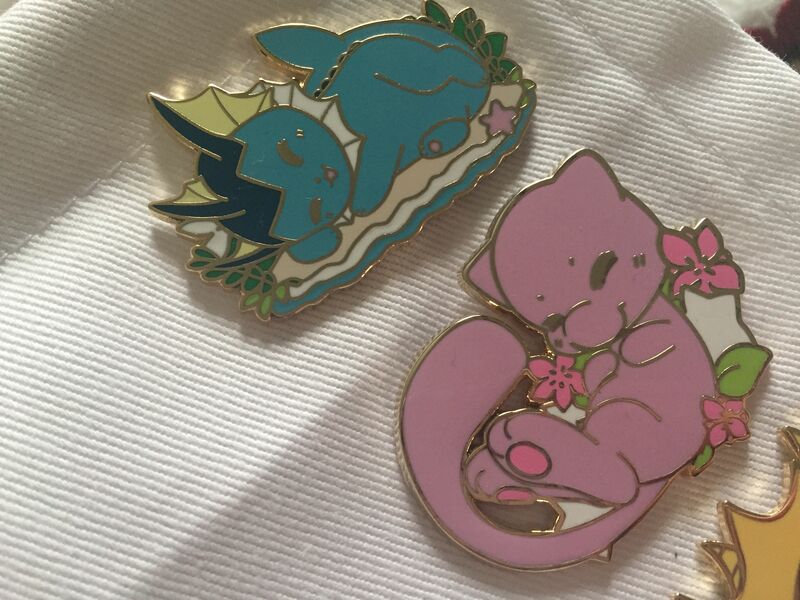 Although I had my heart set on the Vaporeon pin all along, I did fall in love with the Mew pin that was brought out as the first unlocked reward. 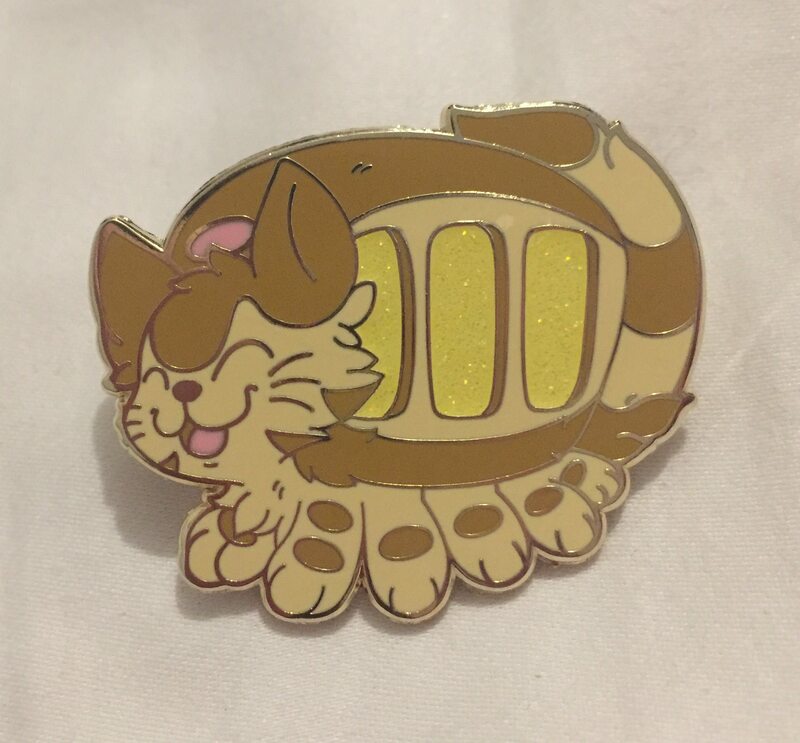 So when Mew came out as a seconds pin, I knew I had to order! It recently arrived in the post and I have to say, I wouldn’t even think it was a seconds pin! 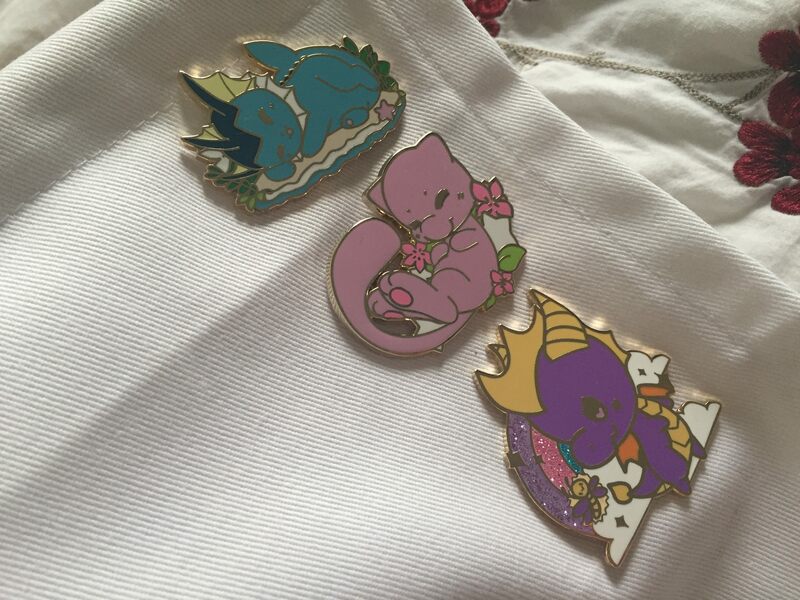 It looks just as good in quality as the Vaporeon pin, as well as some other pins I own by Ohayou Clothing! 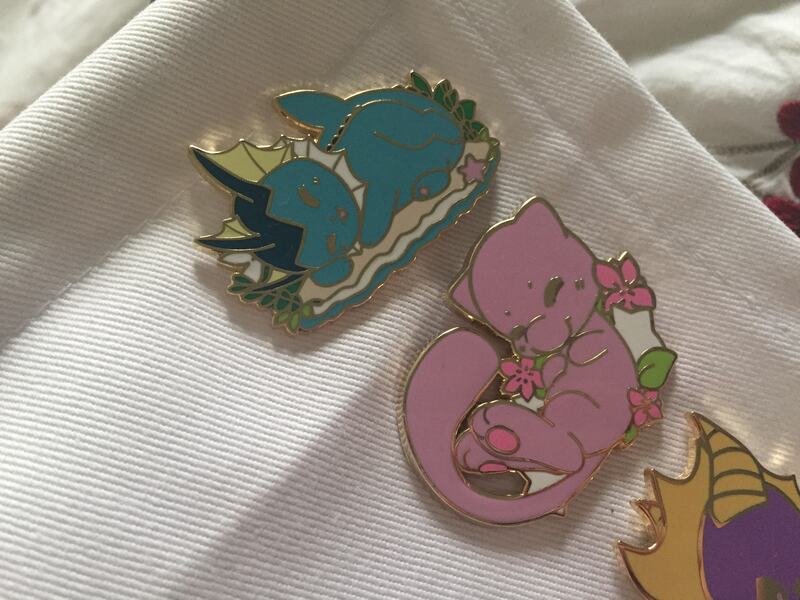 The one thing I love about the Mew pin is that it’s surrounded by Japanese sakura (well it looks like that to me anyhoo! :P) and it’s just so cute! I can’t wait to wear it throughout winter to be honest with my cream jumper. 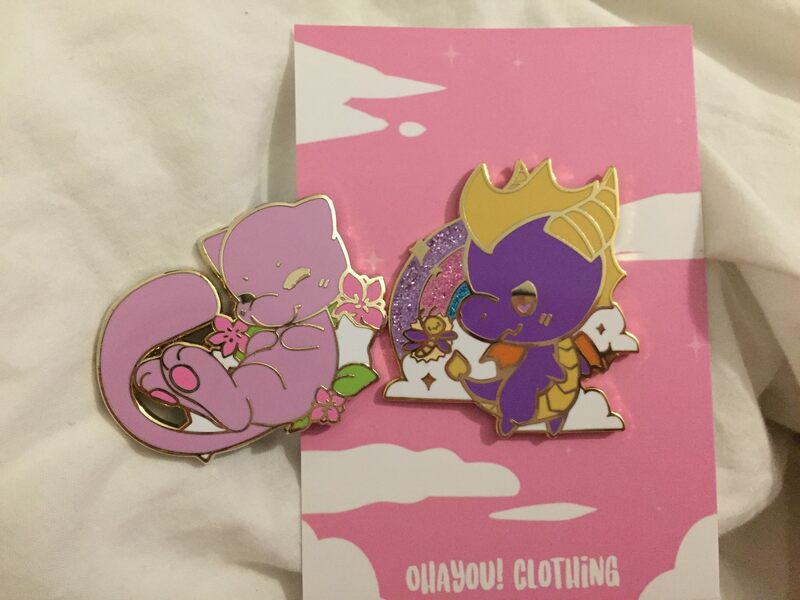 When I ordered my Mew pin I decided to order the Spyro pin that Ohayou Clothing! designed recently. I wasn’t going to to be honest as the smart adult in my brain was saying, “No Nat, you don’t need that!” whereas the nostalgic youngster in my knew she had to have it. Spyro is a massive part of my gaming life as I used to play it when I was younger during the summer holidays with my cousins. We’d take it in turns to go around each world and attempt to complete them 100%. I loved it! So I knew I needed the Spyro pin badge in my life! It’s so adorable and I cannot wait to wear it over the summer and winter months for work. The remastered Spyro games are out in September so I’ll be rocking this pin on jumpers throughout that month for sure. 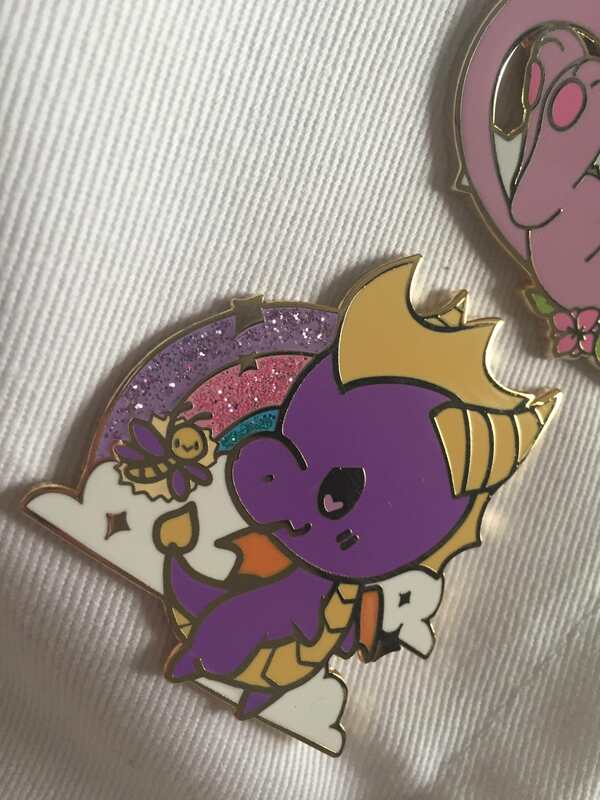 The thing I love the most about this design is how much of a rebel Spyro STILL looks, whilst giving the pins design a cute kawaii feel. Also, look at that glitter, it’s so fabulous! 😀 I know not everyone knows what half of the Pokemon are anymore who are out, but everyone who was around in the 00’s will know who Spyro is. 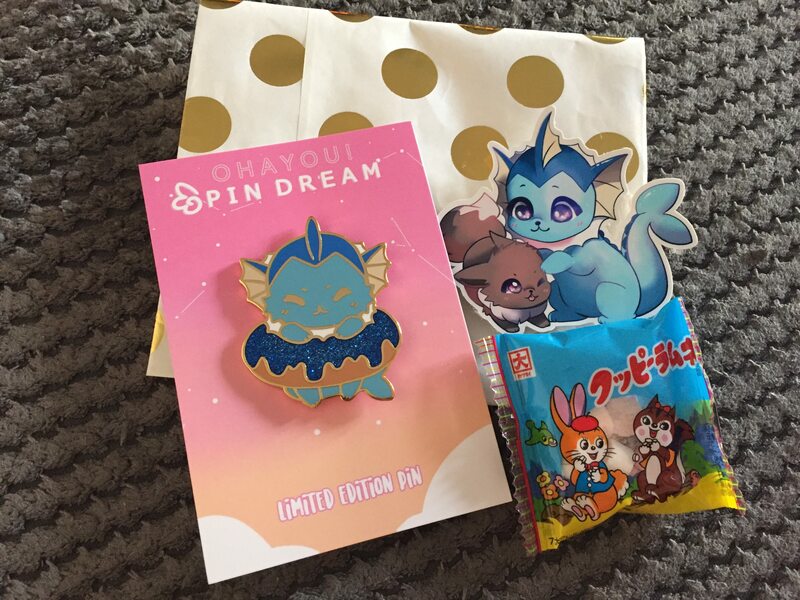 Finally I’m going to talk about the Pin Dream pins I have from Ohayou Clothing! so far. NOW when I started writing this post towards the end of last week, it was before some sad news from Ohayou Clothing about her Pokemon designs and pins. Like when the Kickstarter was around, Nintendo and Pokemon have got to Ohayou Clothing! again and told her she has to stop making and selling Pokemon designs. I am gutted to be perfectly honest with you. 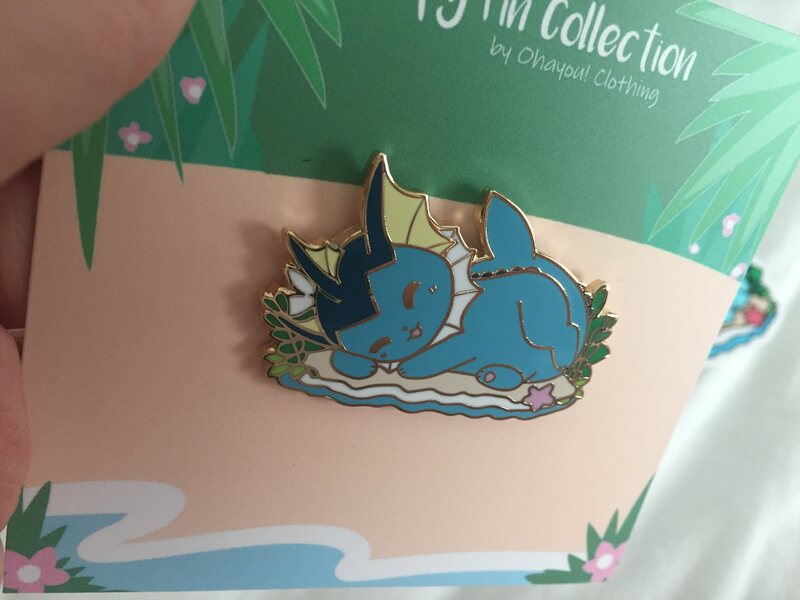 Due to this, the Vaporeon pin will be the last Pokemon pin for the Pin Dream pins. I was so excited for the rest of the Eeveelution doughnut designs to come out, but that aside I’m angry on behalf of Chrissy. There are plenty of other people out there who are inspired by Pokemon and their designs to create their own designs and images of certain ones. 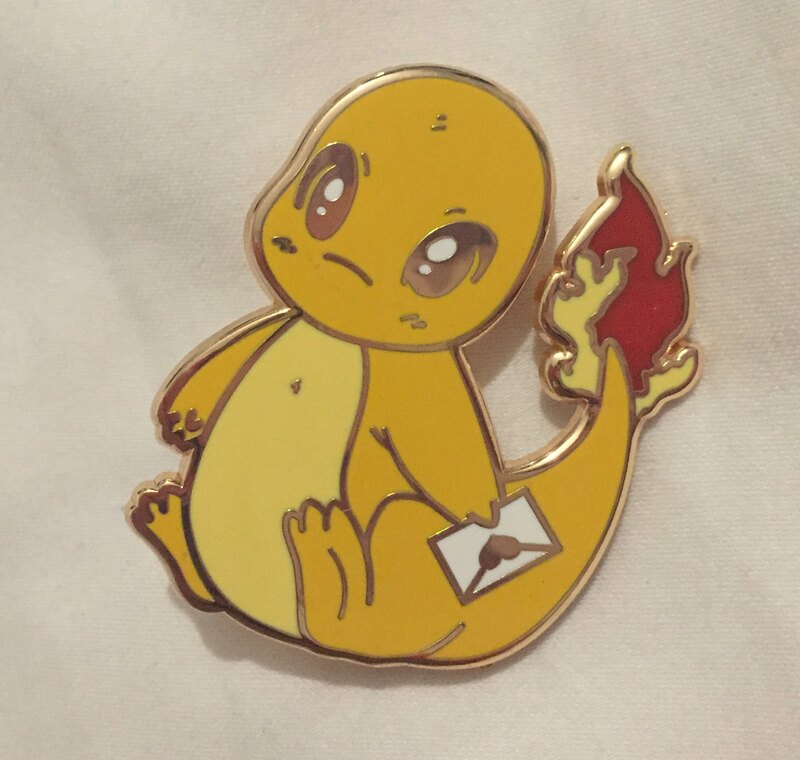 There are loads of Kickstater campaigns out there that are producing Pokemon inspired pins, as well as hundreds of Etsy stores and even Redbubble. 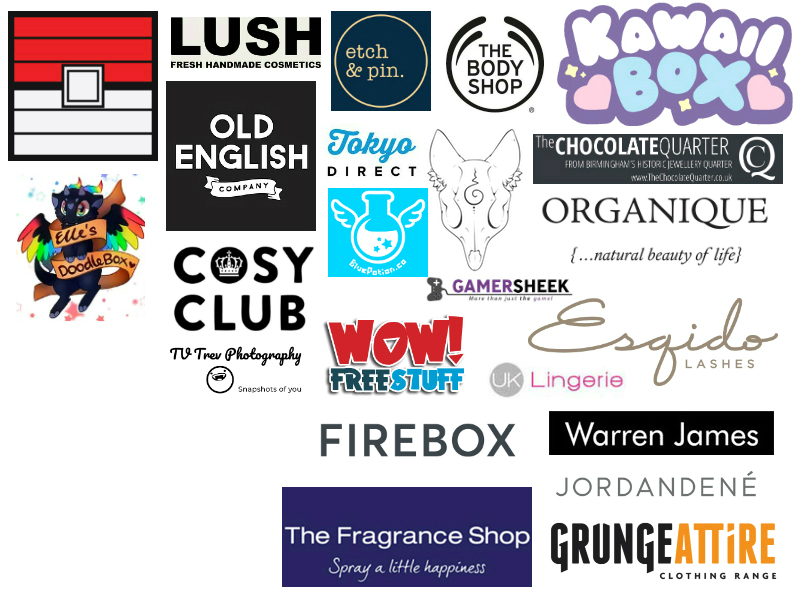 So why is Ohayou Clothing! getting it and no one else appears to be? Well, yet anyway. Either way I will continue to support Ohayou Clothing and Chrissy with her store, as well as with her future Pin Dream designs! 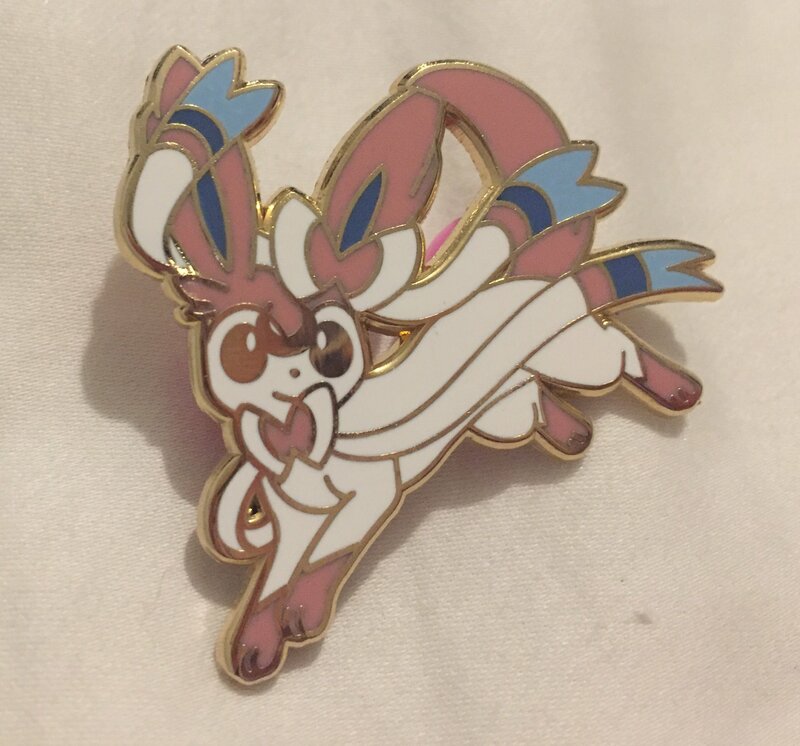 The first pin was an Eevee doughnut pin and I knew I wanted it so much! The design of it is adorable, from the sparkly brown doughnut, to the fluffy tail dangling down, and the adorable little tongue that Eevee is sticking out. 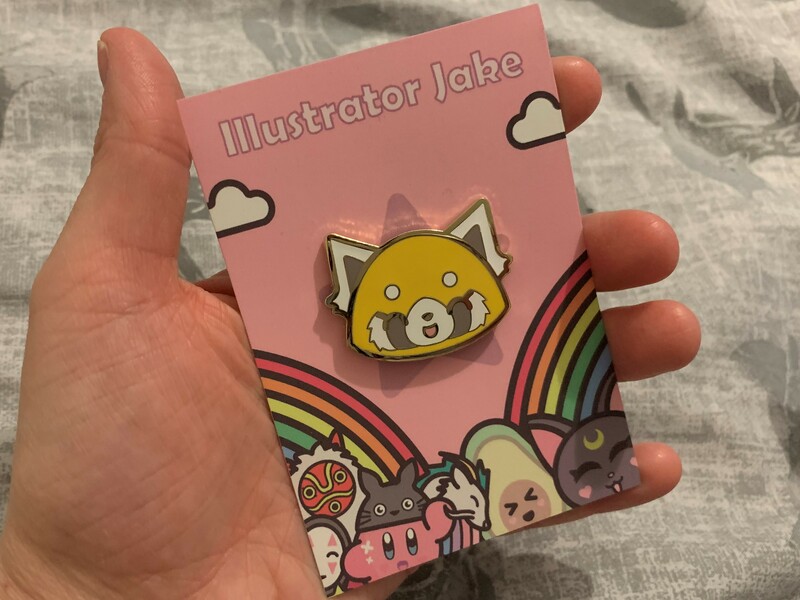 There is nothing wrong with this pin and it definitely ticks all the KAWAII boxes. 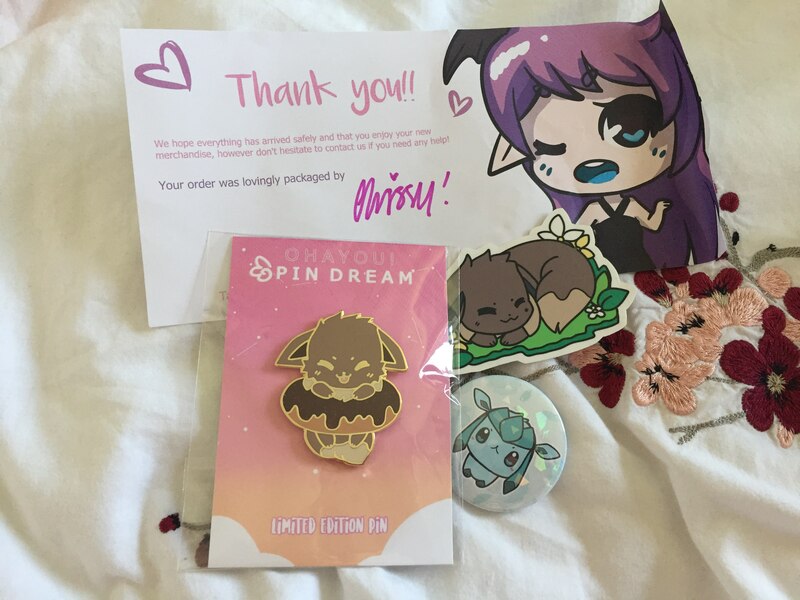 Chrissy always packages all her parcels perfectly and with the Patreon Pin Dream’s you get a couple of little extras too as a thank you for supporting her. With the Eevee doughnut I got a sticker of Eevee sleeping as well as a Glaceon badge. 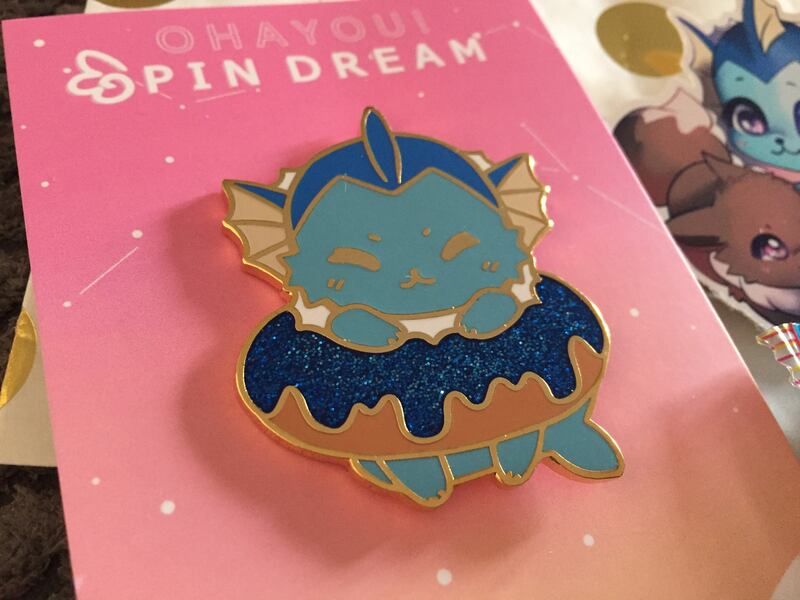 The second Pin Dream is the Vaporeon doughnut and sadly I haven’t had the chance to wear it and show it off yet. This only arrived recently but I’m sure I’ll wear it at some point soon for work or in general. This pin is just as gorgeous as the Eevee one with the blue glitter doughnut this time. 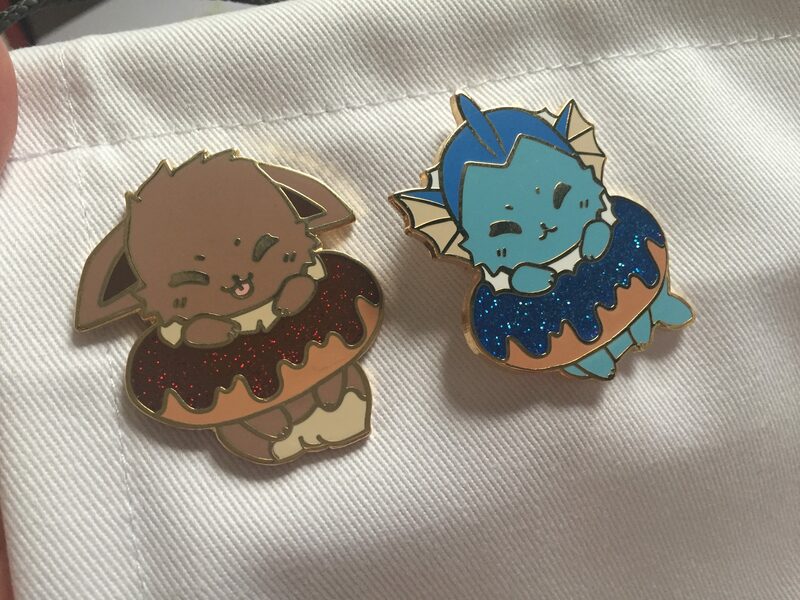 Not going to lie the Eevee pin is definitely cuter than Vaporeon, but the blue makes up for that! 😀 This will be lovely to wear on my red coat during the winter season. 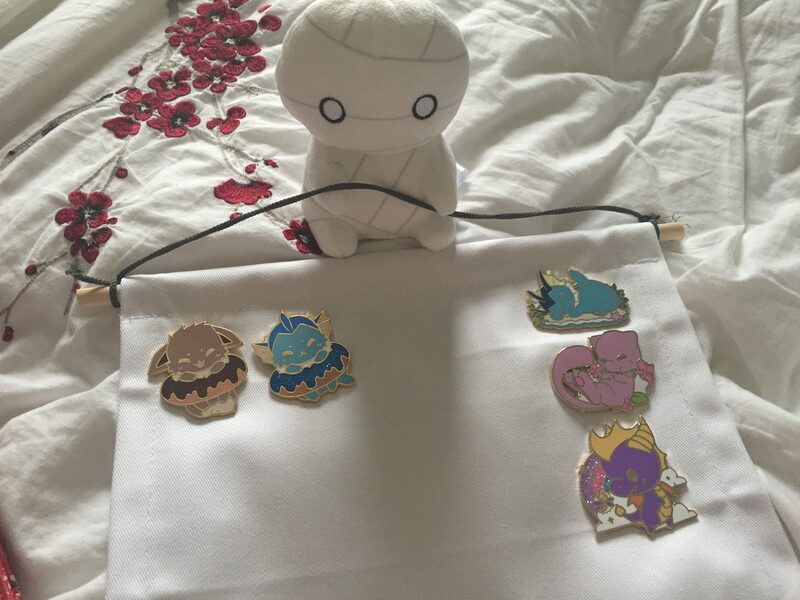 So, that’s my pin collection from Ohayou Clothing! so far. I am gutted about the whole Pokemon palava with Chrissy, especially considering she had so many cute ideas coming up with Pokemon, including Cubone and Dragonite, which I was excited to get during her designing stages. Let me know in the comments what you think of Ohayou Clothing! AND if like me you don’t agree with how Nintendo and Pokemon are treating her, then join me in talking about it online on Twitter and Instagram. Oh by the way, do you guys like my little Mii Kun that has recently come into my life? 😛 I’ll be talking about him properly soon, but I love him so bloody much! 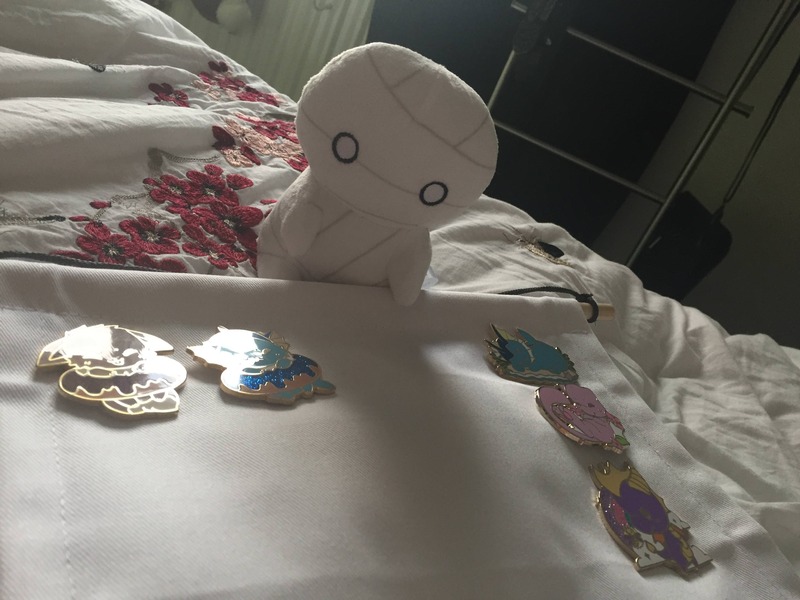 He’s from the anime How To Keep A Mummy, which you should watch if you love cute anime series. Anyhoo, until next time I hope everyone had an amazing weekend!